Just how much the property market has turned in the past 3 months has caught many buyers and seller by surprise. The traditionally hectic period leading up to Christmas generally sees a flood of new listings as sellers motivated by the longer and warmer days, traditionally look to put their property on the market dreaming of a new home for Christmas or over the summer. This year is no exception. The level of new listings has been huge, with 82 properties listed in just the last 3 months. This compares with 73 new listings over the same 3 months last year. However, at the same time the level of sales activity activity across Devonport has not risen to meet this surge of new listings. In the past 3 months there were just 40 property sales. This compares with 66 sales for the same time last year. 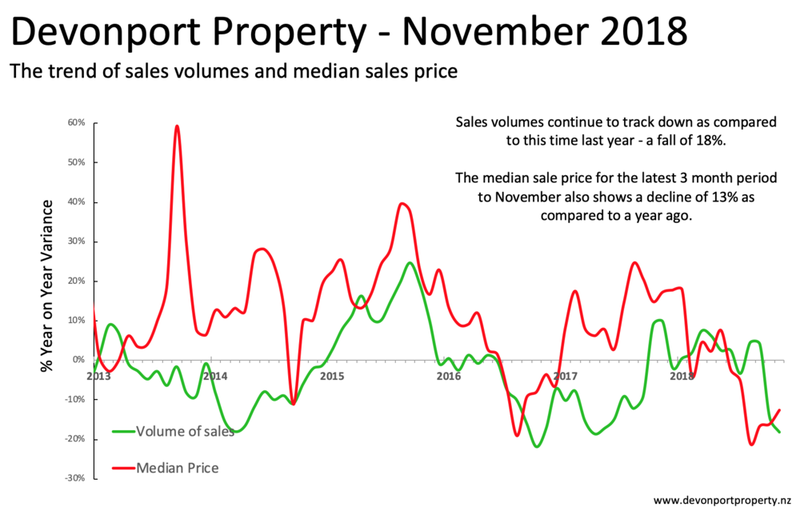 This imbalance of listings vs sales has resulted in a record high level of property for sale with over 60 properties being consistently marketed through November. 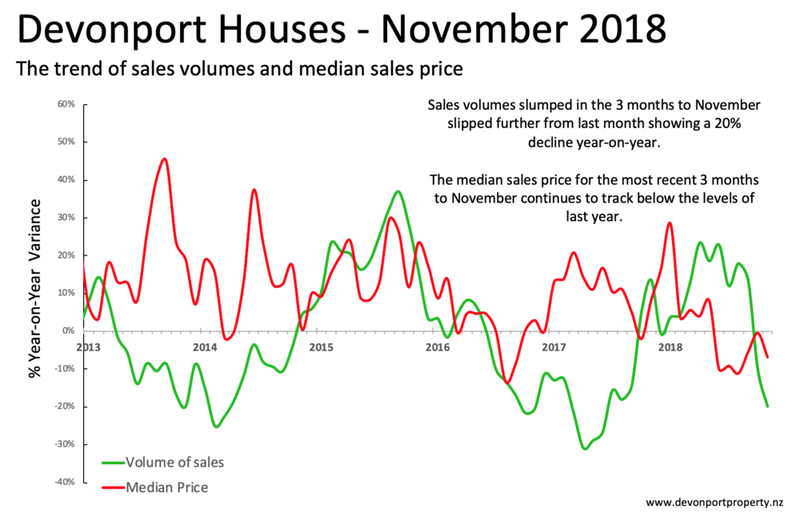 Just be comparison if you look back just 4 months ago at the July report the market was so different with just 33 properties for sale, 54 sold and just 50 new listings - how different to November. Clearly with this abundance of listings coupled with slow sales, the market is very much in the hands of buyers who hold the relative strength of negotiating power over sellers. This is flowing through to prices which have slowed throughout 2018 and are now showing a 13% year-on-year decline. 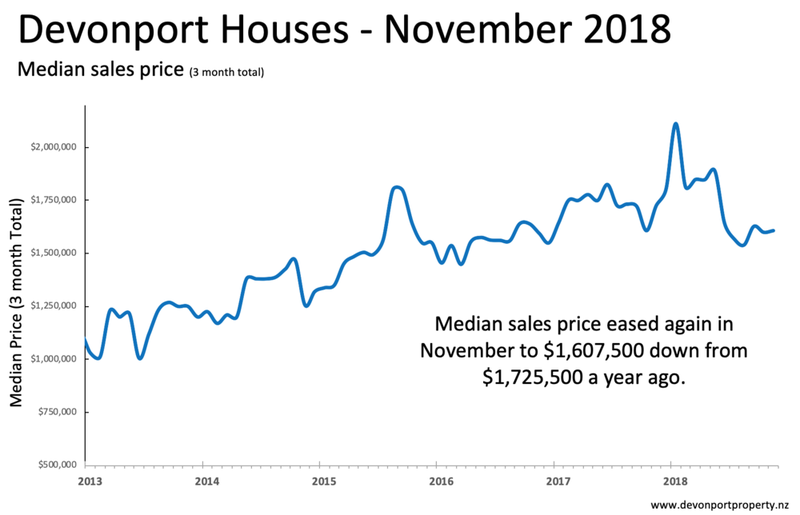 The median price for houses sold in Devonport over the past 3 months was $1,607,500 that’s a 7% decline as compare to a year ago, representing a fall of $118,000 as compared to the same time last year as sales volumes of traditional homes are down 18% over the same period. The reality is that property markets regularly re-adjust both sales volume and price levels, as growth rates become unsustainable. 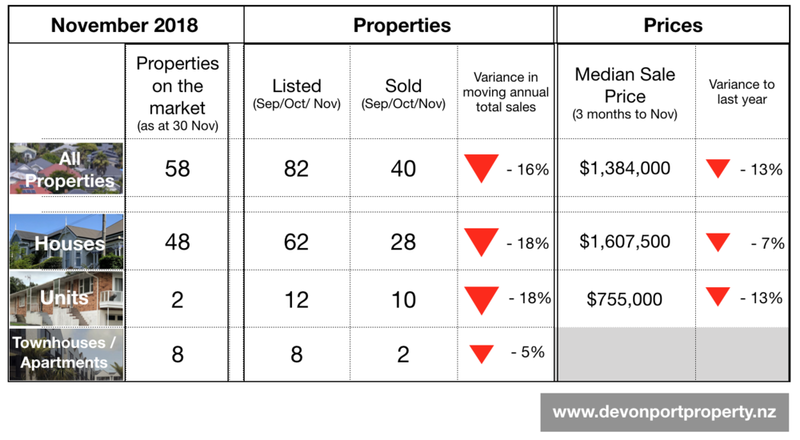 Compared to 5 years ago, the median sale price of a Devonport house has risen by $350,000; whereas over the past 3 years the median sale price has only risen by $60,000. The fact is property prices eventually slow their growth as they reach that peak which clearly looks to have been around the end of 2017. What we are now experiencing is a re-balancing; it may not feel like it, but it is healthy as it avoids the catastrophic effect of a full scale bursting of a property bubble. As to the question of where we are likely to see the market in 2019? The key driver of the market will remain the cost of finance which remains low; the access to finance which remains tight, although recently announced changes to LVR rules will help. The economy and immigration levels are likely to continue to push demand, but overall the market is likely to start the new year much as it closes off the old year – with buyers in the driving seat. Sales of owner-occupied and investment units are beginning to show some signs of recovery. A recovery from a very slow market of the past 2 years. 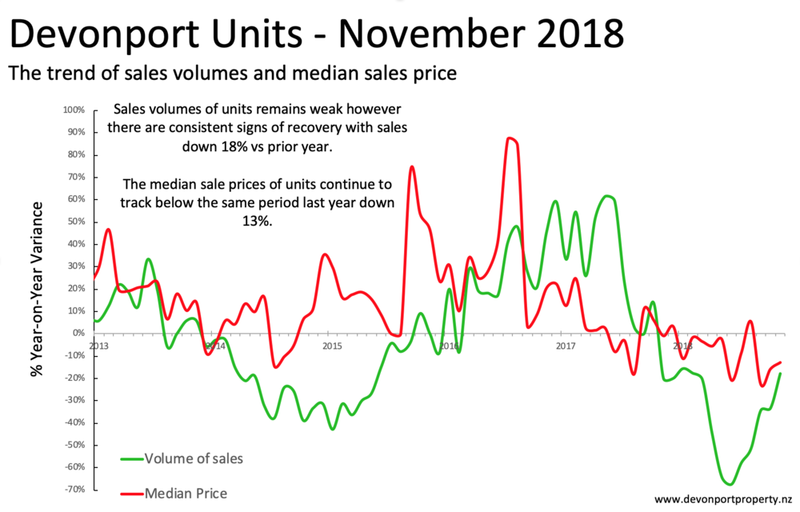 Volume sales of units are still showing year-on-year declines, however the level of decline is lessening and if the trend were to continue we may see in the next few months some year-on-year growth. That growth would though be at 3 monthly sales levels of a dozen or so - far from the levels seen 2 years ago when sales over a 3 month period topped 17. 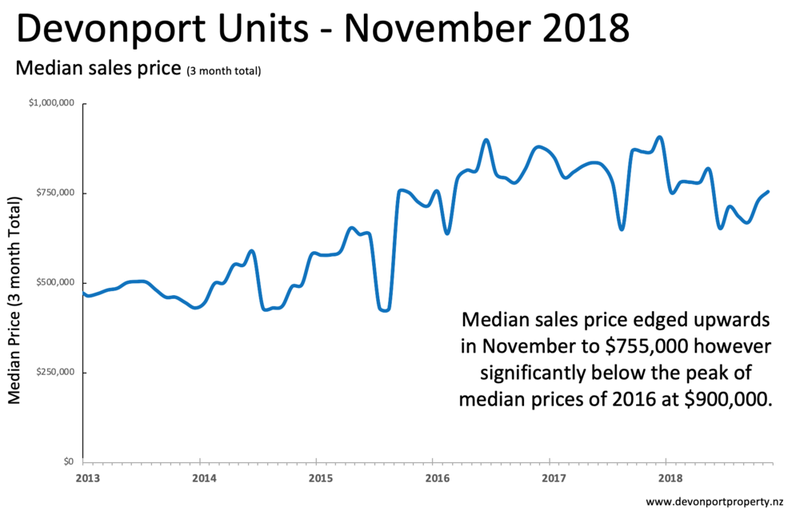 The median price of units sold in Devonport over the past 3 months edged up slightly from the winter period reaching $755,000 demonstrating some strengthening in demand.